Fine dining, casual dining or outside catering. As the Island's premier hotel, conference and banqueting operation, the Group often serves up to 3000 meals in a single day. From intimate gatherings to large-scale corporate events, all benefiting from the Sefton Group's passion for exceptional customer service. 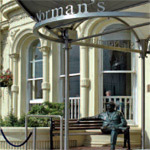 Sir Norman's has an extensive wine list and menu and a relaxed atmosphere and is open from 10am to midnight. 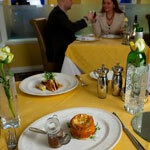 Afternoon teas are available and a full menu for lunch, dinner or just a snack - we cater for all appetites. Relax and enjoy our Resident Pianist playing on Friday and Saturday evenings. The Gallery has been awarded a coveted second AA Rosette and provides true service and exceptional food. We have a large selection of mouthwatering dishes available including a Flamb� service. Wherever possible we use only the finest locally provided Manx produce which presents you with a true flavour of the Isle of Man. 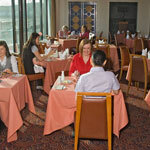 The Paragon carvery style restaurant is open for lavish breakfasts, carvery lunches and dinners, providing relaxed dining in incomparable surroundings. Bar snacks and light meals are also available.